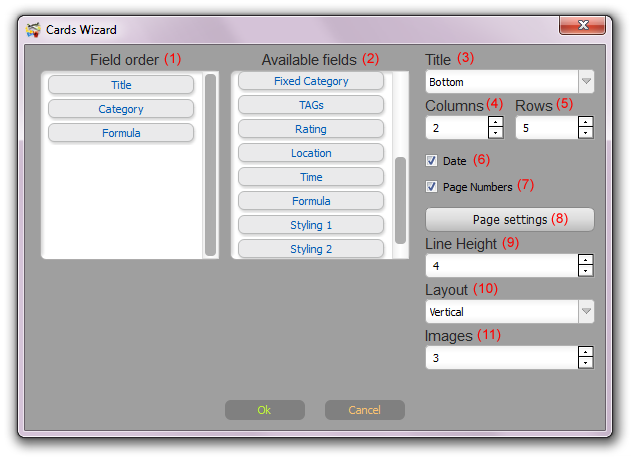 Checklist Wizard is used to create a preliminary template for the checklist report. Drag & Drop fields from 'Available fields' (2) to 'Field Order' (1). Title (3) - Choose title placement - Hide/Top/Bottom. Columns (4) - Number of columns. Date (5) - Add date to the Title. Page Number (6) - Add a page number to the Title. Page Settings (7) - Page size and layout settings. Line Height (8) - Row’s height (height of text lines in the report). 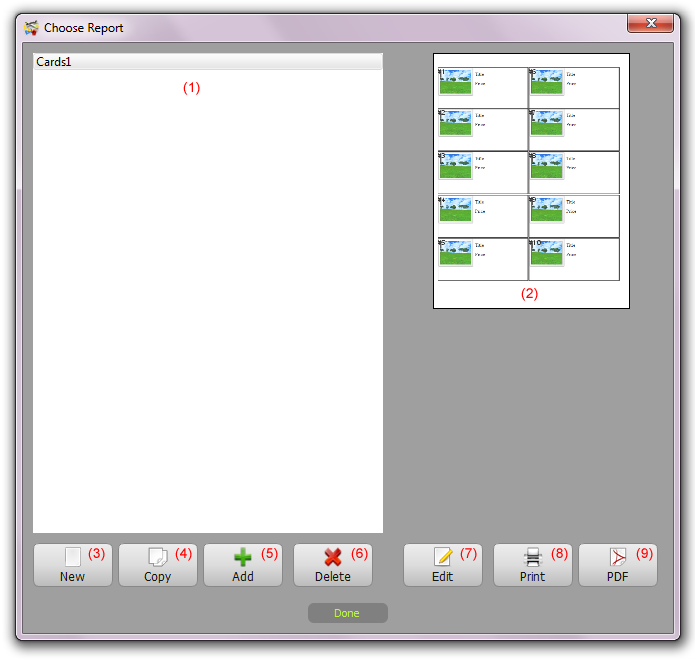 Cards Wizard is used to create a preliminary template for cards-style report. 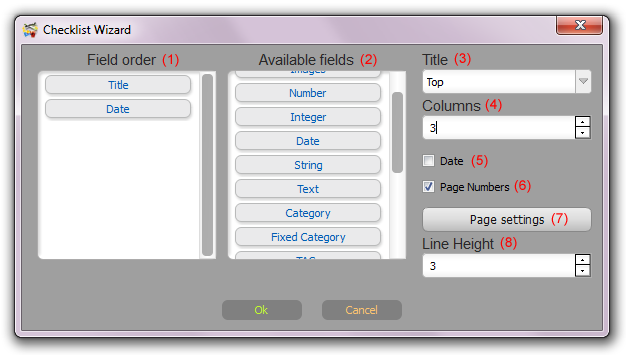 Drag & Drop fields from 'Available fields' (2) to 'Field Order' (1). Columns (4) - Number of card columns. Rows (5) - Number of card rows. Date (6) - Add date to the Title. Page Number (7) - Add page number to the Title. Page Settings (8) - Page size and layout settings. Line Height (9) - Height of text lines in the report. Layout (10) - Card layout. Images (11) - Number of images per card. Report selection dialog is used to manage advanced reports. Existing reports list is shown in the list (1). Currently selected report preview is shown in the preview area (2). New (3) - Create a new advanced report. Copy (4) - Duplicate a selected report. Add (5) - Add existing report. Customers can choose any report generated in another database or downloaded from the Web. Delete (6) - Delete selected report. Edit (7) - Edit report. Print (8) - Print selected report. PDF (9) - Generate a PDF for selected report. 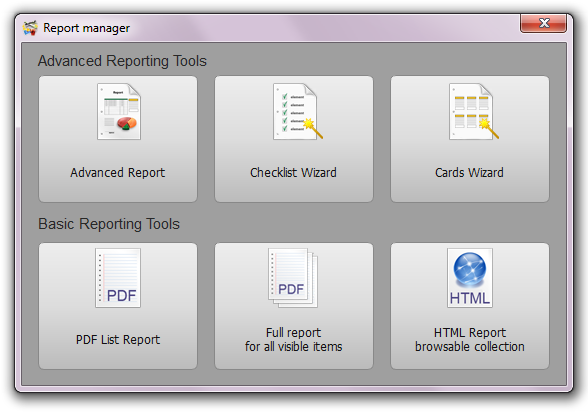 The Report Creator is used to create and edit advanced reports. This is a powerful publishing software module to create works such as reports. 1. List of pages templates’ sequences. You can create report page template and set to how many pages to generate using this page template. For example, the page 'Title' is set to be used once; 'Pages 2' template is set to be used for unlimited pages (rest of report). 2. Add an additional new page template. 3. Delete selected page template. 4. Page properties. Used to set number of pages and title. 5. List of available blocks. Blocks are created to be used multiple times inside the page. For example, one block with image, title, and price was created. This block was placed inside report page three times. To add a block into current page drag and drop it to the working area. 6. Add a new block. 7. Delete a selected block. 8. Block properties. Used to set block size and its title. 9. Set scale to 100%. 13. Enable/Disable snap to grid. 14. Report properties. Used to set report name, page size, and layout. 18. List of available report items. Drag and drop items to working area. Hold 'Alt' to add DB field value with the field name. - Variables - report properties, like database name, date, current page number. - Objects - external images, custom text, barcodes. 19. Properties for currently selected item. 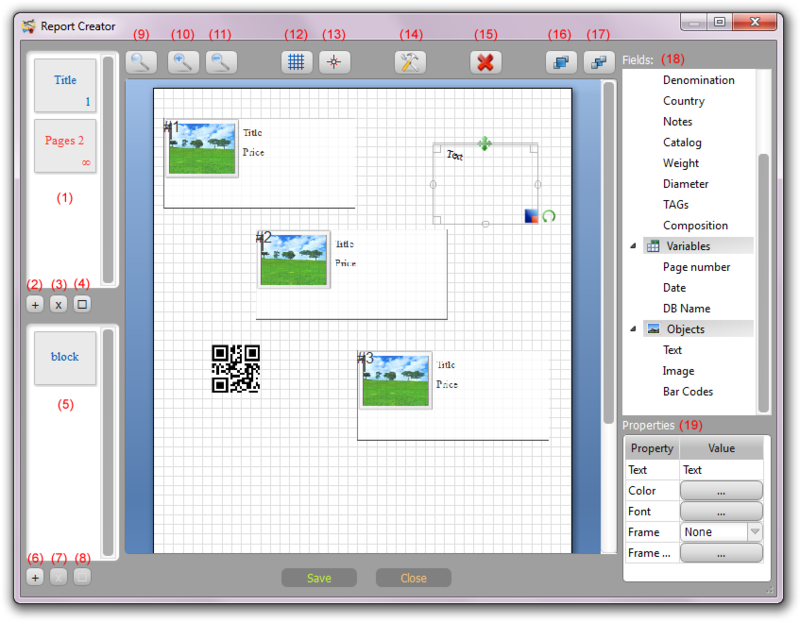 Here there can be set various properties, like data source, color, font, alignment, frame settings, etc. 1. Some features available only in PRO version. 2. Barcodes are not generated in the final report for the items with an incorrect source data. 3. Barcodes can contain your custom text of data from the database fields. 4. Keep the proper blocks order. The data will be filled on page with same order.